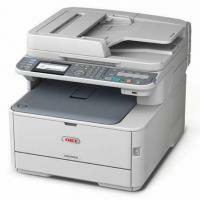 OKI MC562 is a multifunction printer which offers scanning, printing, copying and faxing. It has a reversing automatic document feeder with the storage capacity of 50 sheets capable of processing two-sided multi-page documents. The OKI MC562 is an all in one colour printer that offers colour printing at a very high resolution. OKI MC562 gears up lot of space and is bulky in looks. It has a large control panel at the front side of the printer that offers you many function buttons with a large display screen. The menu system of this printer is complex when compared to other multifunction printers with touch screen display. The device also boasts high capacity OKI MC562 toner cartridge that increases the productivity of the printer. It supports 50 sheets RADF(Reversing Automatic Document Feeder) and also offers duplex unit that can handle paper with up to 176 gsm thickness. The OKI MC562 has standard 256 MB of RAM which can be expandable up to 768 MB. It also supports USB and LAN interfaces for flexible connectivity options. The paper handling capacity of this device is up to 350 sheets of blank media. The device comprises of four machines into one single multifunction printer. Along with productivity and quality performance it also offers space-saving and money-saving qualities. OKI MC562 is suitable for small to large workgroups. This multifunction colour printer supports wide variety of print media, though it can handle only 350 sheets of blank paper which might be difficult in handling a large print job. It also offers space-saving and money-saving qualities which might be the right choice for any workgroups that is looking for productivity and high performance. The four colour multipack OKI MC562 toner cartridges can help in the cost efficiency of printer. What to do if your OKI MC562 printer is giving faded or light printed images? It is possible the OKI MC562 toner cartridges are not installed properly. So install the toner cartridge again properly to resolve the issue. Replace the toner cartridges if the ink level is too low. The issue could be raised if paper is moist. Use the paper stored in proper temperature and humidity conditions. If your paper is unsuitable and the settings of media type and width are incorrect. Then, Press the key and select [Paper Setup] from the paper tray you are using, and then select the proper values for [Media Type] and [Media Weight]. Or, select the thicker values for [Media Weight]. The paper can be recycled if the quality of paper used is not good. Press the key and select [Paper Setup] from the paper tray you are using, and then select the thicker values for [Media Weight]. Receiving yellow and green colour in the original document. If the original data was transmitted, ask the sender to change the colour of the original document to black and white. Receiving faded images may be because of your printer’s dirty LED heads. Wipe windows of all the LED heads with soft tissue paper or dry lint free cloth. The toner is low. Replace the OKI MC562 toner cartridges in order to receive cartridges of high quality. If the paper you are using is unsuitable. Then, use the good quality paper that is recommended to get better prints. Q. Can you please provide some details about OKI MC562 toner cartridges? A. Sure. These are premium quality OKI toner cartridges that print in black. You can print up to 7,000 pages with OKI MC562 toner cartridges and be sure of high-quality output as they are quality assured and sent for sale only after they are fully tested. A. Please don’t worry at all as the warranty on OKI’s printers does not become invalid if compatible cartridges are used in it. More and more customers are already using them and have not reported any problem with it. Just make sure that you don’t accept any terms or policies that may pop up on the screen and be careful. Q. What do I use to clean toner cartridges with? Is a soft cloth to be used for cleaning? A. Yes, please use a clean, lint-free cloth for wiping the cartridges. Use a brush to gently clean the toner powder that spills around; you can also use a cool, damp cloth in place of a brush. Avoid use of hot water or detergents for cleaning toner powder from surfaces as they make the stains permanent. Q. If I buy a multipack of compatible OKI MC562 toner cartridges (pack of four), will it save me a good amount? And does the black cartridge print more pages? A. Yes, buying a multipack of these toner cartridges will save you a considerable amount of money. This multipack is an ideal deal for budget-conscious users. The black toner cartridge in this pack prints more pages (up to 7,000) than the colour ones, which print up to 5,000 each. Q. How many sheets are supported by Reverse Automatic Document Feeder? A. The printer supports 50 sheets in Reverse Automatic Document Feeder. Q. Does the OKI MC562 printer supports email and mobile printing? A. Yes, the printer supports email and mobile printing. Q. Do you offer OKI MC562 printer? A. Unfortunately, we do not supply printers on this site, we only deal in cartridges and other printer consumables like paper. To get the printer refer to other online websites available. A. During the printing process, paper, toner, and dust particles might get accumulate inside the printer. Over time, this can cause print quality problems, such as toner specks or smearing, and paper jams. To prevent such type of problems, you should clean the cartridge area and the printer media path regularly. Q. I have an OKI MC562 printer and looking for the compatible toner cartridges for my printer. Which one would you suggest? A. We would recommend you to buy the compatible OKI MC562 toner cartridge for your printer. It will offer high-quality prints and better value for money. You can find the product on this page of our website: https://printerinkcartridges.ie/oki-toner-cartridges/oki-mc/mc562. Can order for the multipack or a single pack OKI MC562 toner cartridges according to your choice. Q. I have recently purchased OKI MC562 toner cartridge from your site but unable to install them. What should I do now? A. You can ask for help at 019610106 or contact us my email at info@printerinkcartridges.ie. Q. I need a OKI MC562 toner cartridge. Where will I get the information about the stock of this toner cartridge? A. To check the stock of your item, you can contact us at 048 30833221. Q. Does the printer supports coloured printing? A. Yes, coloured printing is supported by this printer. Q. How to change the OKI MC562 toner cartridges of the printer? A. To maintain the high-quality output from your printer, you must use the new cartridges for your printer. Q. How to remove jammed paper from the OKI MC562 printer? 1. Loading the paper: When loading the paper, Fan the stack of paper before placing it in the tray. This will remove the dust from the paper. Correctly place the paper in the tray under the tabs and remember to not fill it above the "PAPER FULL" mark. Adjust the tray guides for the correct paper size. 2. Recommended Media: Use specific paper for the printer to get good results. When printing on heavy/thick types of paper, use the manual feed tray at the front of the printer. This will provide a straight paper path to prevent potential paper jams. 3. Cleaning: Periodically wipe the rubber rollers inside the area that holds the paper tray with a soft cloth. Paper dust may cause these rollers to slip and not feed the paper properly. Q. My printing office has extra OKI MC562 toner cartridges but the OKI MC562 printer has broken. Can we use the cartridges with any other printer? These printers are equally compatible with the cartridge and will yield excellent results. Q. What are the colours used with OKI MC562 printer? Can I use colours apart from them? A. The OKI MC562 toner cartridges comes in Black, Cyan, Magenta and Yellow colour. The printer has dedicated colour slots for them. It is always advisable to use only the colours which are prescribed by the printer manufacturers. Q. I am in a dilemma whether to buy an original cartridge for OKI MC562 printer or use your compatible version of cartridges? OKI MC562 being a high-end photo printer is very delicate, by using the compatible version will I hamper the printer controls? A. Buying the compatible version of cartridges is always beneficial over buying the original version. The OKI MC562 toner cartridges yield more print copies than the original ones at a much cheaper price. The OKI MC562 is used to print high-quality photo prints at a professional level. This requires a lot of ink which can be heavy on the pockets. Using the compatible version is friendly on the pockets. The compatible version is nothing but refilled or remanufactured version of the cartridge. Compatible cartridges have more ink than the original cartridges and the quality of prints is on par with the originals. You can buy the compatible cartridges as they are equally efficient as the originals and at a very minimal cost. However, if you are going to print professional high-quality photographs that you expect to last for years then we would you to go for original ones. Q. Does OKI MC562 printer have automatic document feeder(ADF)? A. OKI MC562 printer has 50-sheet reversing automatic document feeder (RADF) which works on its own thus saves on time and energy. OKI MC562 printer being a bulk printer has to have this mandatory feature for making printing easy for the user. Q.The quality of prints has been deteriorated since a week after I changed the OKI MC562 toner cartridges. The printed images are fading vertically and the prints are unclear. What should I do? Have I received faulty cartridges? Receiving faded images may be because of your printer’s dirty LED heads. Wipe windows of all the LED heads with soft tissue paper or dry lint-free cloth. Since in your case you have recently changed the cartridges we assume the toner won’t be low. Check on the other two factors and resolve the same. Q. I am a cyber café owner from Belfast and I wanted to order the cartridges for OKI MC562. The delivery is required to be delivered within this week since my stock of cartridges is about to be exhausted. Where can I appeal for a fast delivery? What will be benefit or discount on bulk orders? A. We don’t offer any discount on bulk orders since our cartridges are on lowest price they can be on. Though we offer a coupon for 5% discount if you like us on Facebook, follow us on twitter or rate us at google plus. All our deliveries are made within 24 hours of the order being placed. 90% of the orders made before 2 pm are dispatched the same day. Only when there is an off lot traffic or the rush of work on our courier partners, that’s when the delivery might take 1-3 days. Be carefree as the delivery of your cartridge won’t take more than 3 days. For checking on the stocks and further assistance on bulk orders feel free to call on 048 30833221.